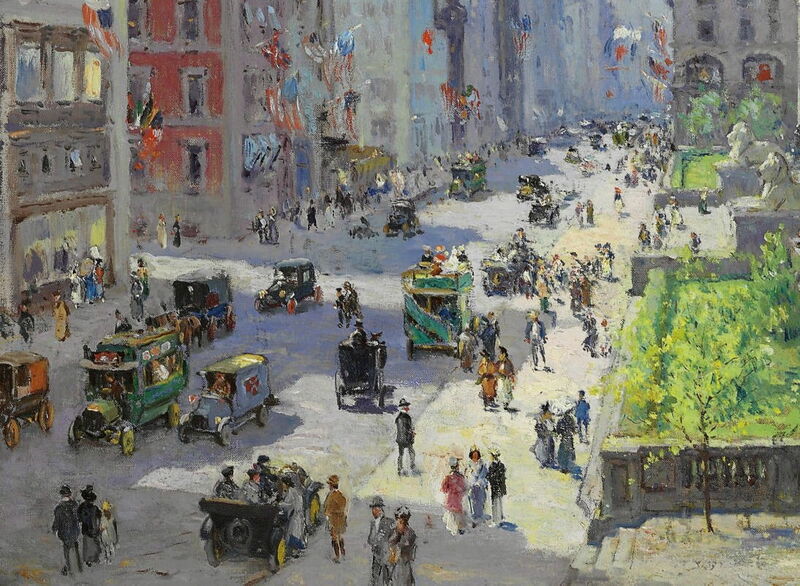 Colin Campbell Cooper (1856–1937), New York Public Library (detail) (c 1915), oil on canvas, 73.7 × 92.1 cm, Private collection. Wikimedia Commons. At about the same time that Camille Pissarro started to paint his urban series featuring casts of hundreds of figures, carriages, and more, the American Colin Campbell Cooper (1856–1937) was spending his summers in the artists’ colony of Laren, in the Netherlands. He had already studied in Paris, at the Académie Julian, and had seen Impressionist paintings, and most probably the work of Pissarro. 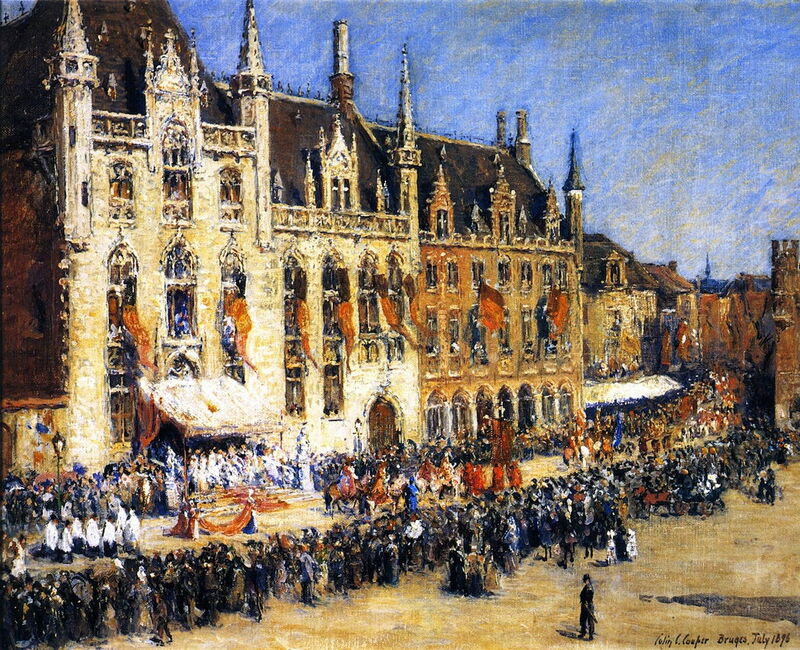 Colin Campbell Cooper (1856–1937), The Pageant at Bruges (1896), oil on canvas, 40.6 x 50.8 cm, Private collection. Wikimedia Commons. When he was travelling in Europe in 1896, he painted this procession and its attendant crowd, in Bruges. It was at about this time that Cooper’s style became overtly Impressionist, but he does not seem to have painted many other scenes involving crowds like this. 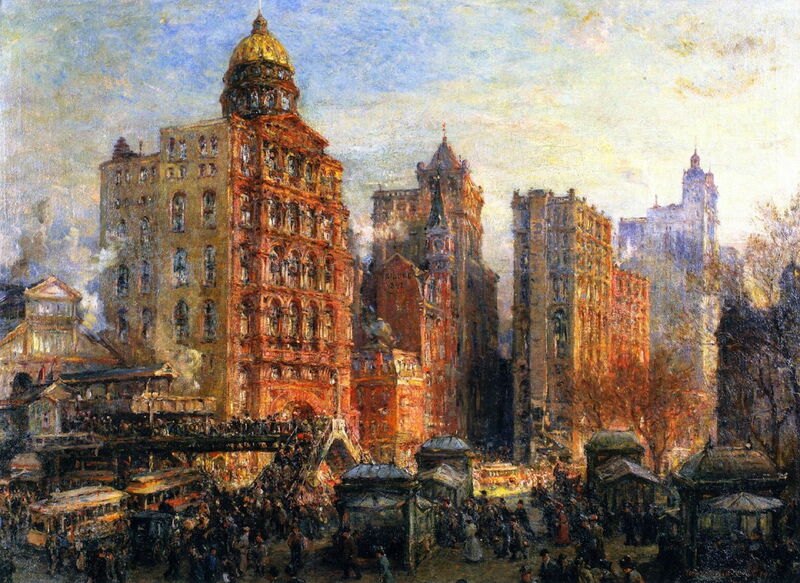 Colin Campbell Cooper (1856–1937), The Rush Hour, New York City (c 1900), further details not known. Wikimedia Commons. One of Cooper’s earliest American cityscapes featuring crowds is this remarkable painting of The Rush Hour, New York City from about 1900. Although its figures are mainly in the foreground area of cast shadow, this is literally teeming with people, who are pouring along the street, packing the stairways and walkways to a station, and seething around booths and tramcars. Colin Campbell Cooper (1856–1937), Broad Street Station, Philadelphia, in the Rain (c 1905), other details not known. Wikimedia Commons. 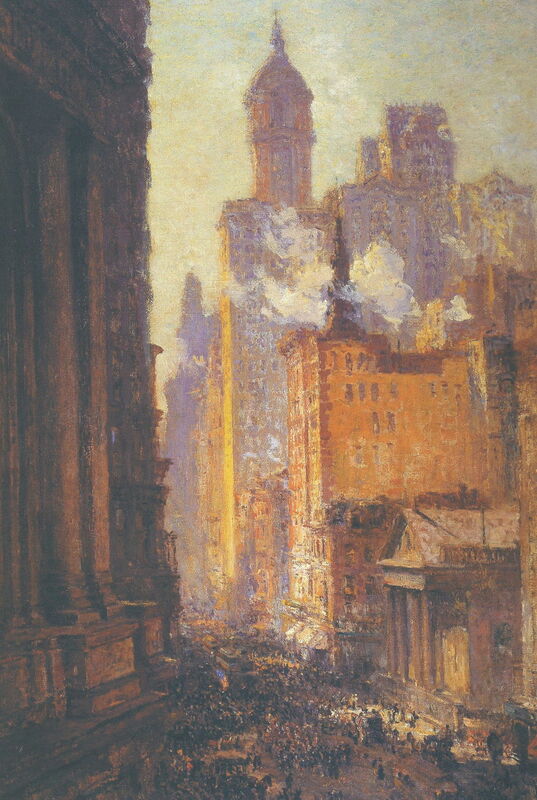 Cooper returned to the US, and in 1904 set up his studio in New York City, where he painted the buildings as they rose towards the sky, and the streets as they filled with the bustle of everyday life. These paintings have come to document the huge changes which the city went through. 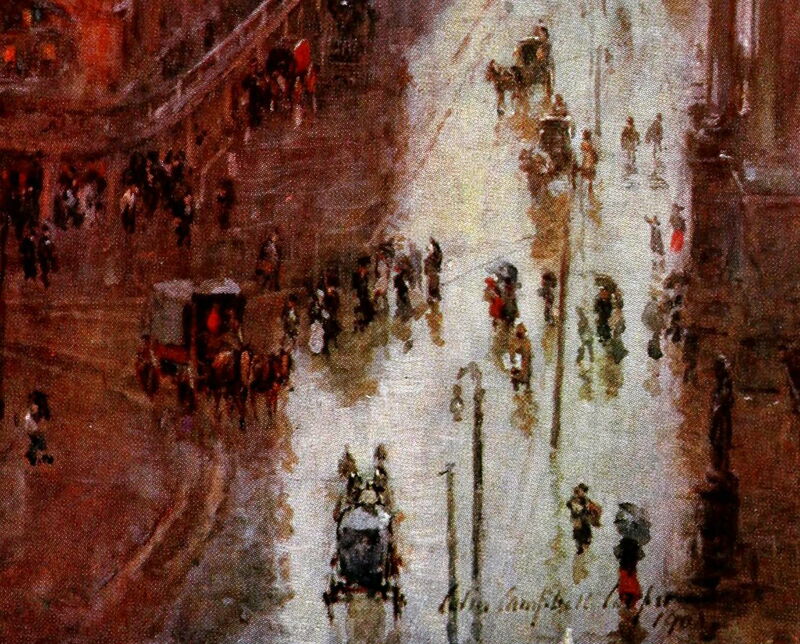 Although the crowds are more sparse in this painting of Broad Street Station, Philadelphia, in the Rain (c 1905), the detail below shows how carefully those figures have been painted. There is none of the loose and gestural construction seen in Pissarro’s crowds. Colin Campbell Cooper (1856–1937), Broad Street Station, Philadelphia, in the Rain (detail) (c 1905), other details not known. Wikimedia Commons. 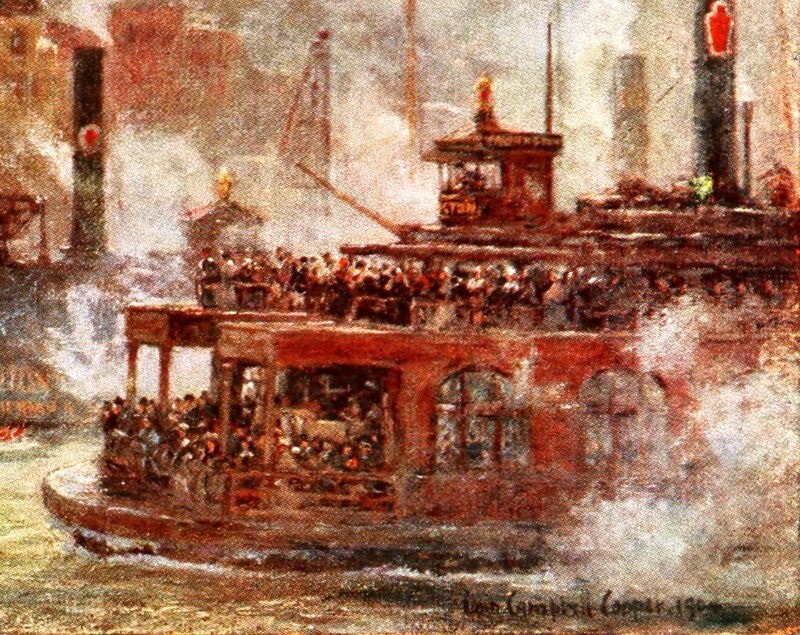 Colin Campbell Cooper (1856–1937), The Ferries, New York (c 1905), other details not known. Wikimedia Commons. Cooper followed the crowds onto The Ferries, New York (c 1905), where they are as densely packed as they were in The Rush Hour above. As the detail below shows, he continues to paint the visible figures in careful if not painstaking detail. Colin Campbell Cooper (1856–1937), The Ferries, New York (detail) (c 1905), other details not known. Wikimedia Commons. Colin Campbell Cooper (1856–1937), Flatiron Building, Manhattan (c 1908), casein on canvas, 102 x 76.2 cm, Dallas Museum of Art, Dallas, TX. Wikimedia Commons. 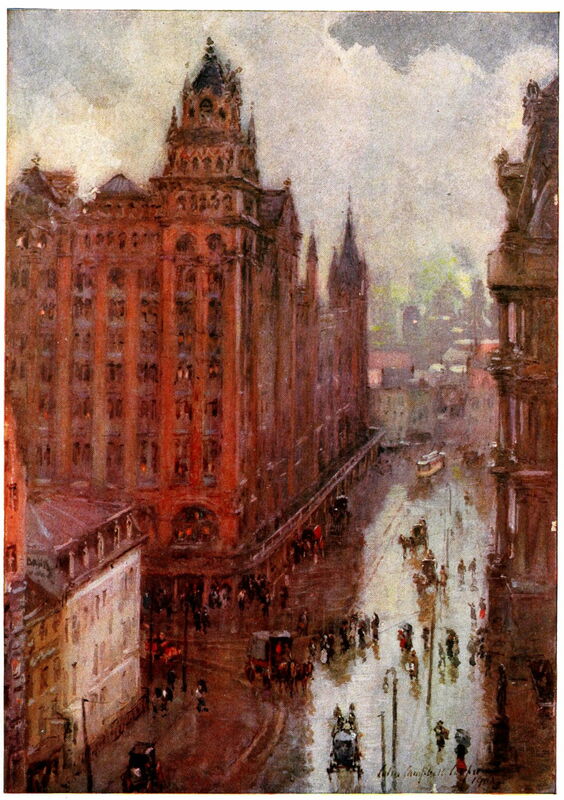 When he painted the Flatiron Building, Manhattan in about 1908, Cooper used casein paints, which have been most popular among illustrators, and have seldom been used in painterly styles. The figures, carriages and other movable objects have rich detail which the buildings lack. 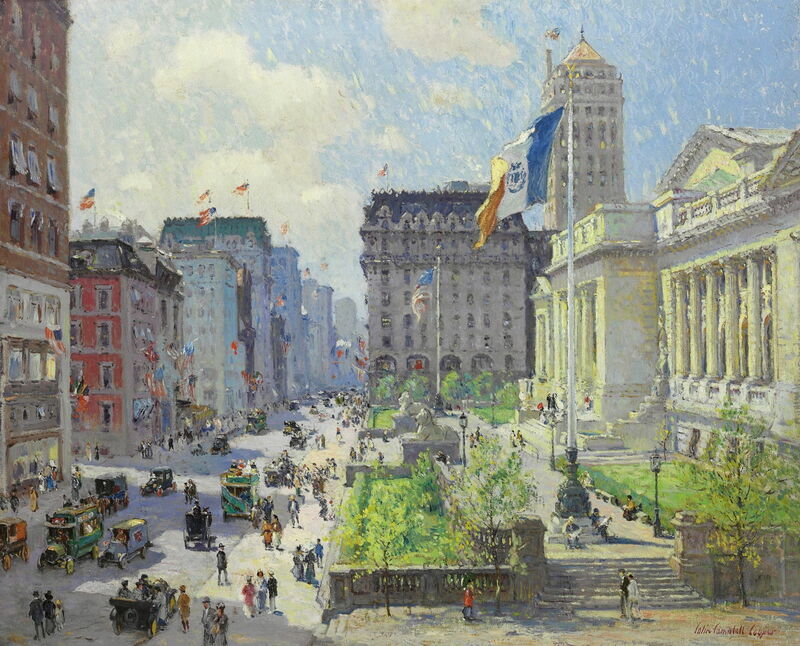 Colin Campbell Cooper (1856–1937), Broadway from the Post Office (Wall Street) (c 1909), oil on canvas, 130.5 x 89.9 cm, City of Santa Barbara, Santa Barbara, CA. Wikimedia Commons. Although more distant figures in this view of Broadway from the Post Office (Wall Street) from 1909 start to fuse into a vaguer mass, there are still some whose hats and clothing can be resolved. Colin Campbell Cooper (1856–1937), New York Public Library (c 1915), oil on canvas, 73.7 × 92.1 cm, Private collection. Wikimedia Commons. When the streets are quieter, Cooper takes care to show tiny details, such as the posters on the side of a motor bus, fashion in clothing, and crisp white shirts and blouses. These are even clearer in the detail below. Cooper’s approach to cityscapes is quite different to Pissarro’s. The buildings – which at first seem to dominate his paintings – provide backdrop, rhythm, and vertical form. All the finer details, over which he must have lavished such care and attention, are in the figures, vehicles, and the action in the street. The figures may be Lilliputian in scale, thanks largely to his elevated and distant viewpoints, but they are essential to the image. 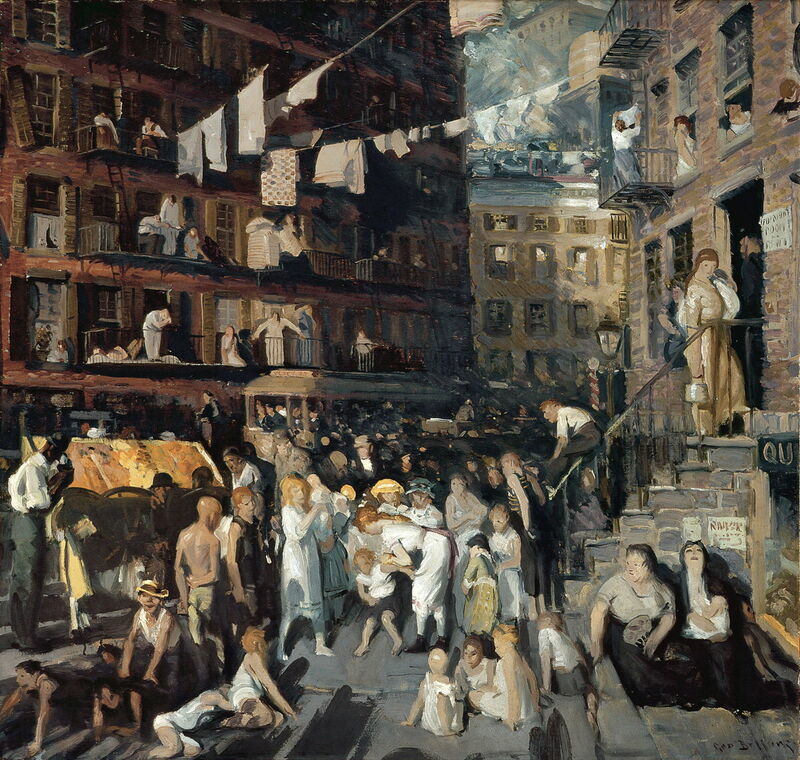 This contrasts with the approach of another great artist of New York City in the early twentieth century, George Bellows (1882-1925). Bellows first moved to New York City to study under Robert Henri at the New York School of Art in 1904, just as Cooper was setting up his studio in the city. By 1906, Bellows had established himself in a shared studio, and was busily painting street scenes. Unlike Cooper, he was little interested in the buildings, much more in the people who lived, worked, and recreated in the city. 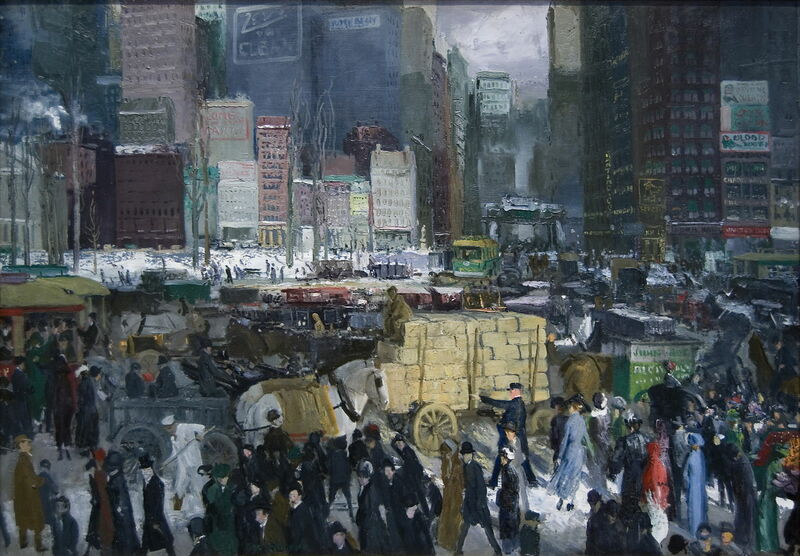 George Bellows (1882–1925), New York (1911), oil on canvas, 106.7 × 152.4 cm, The National Gallery of Art, Washington, DC. Wikimedia Commons. 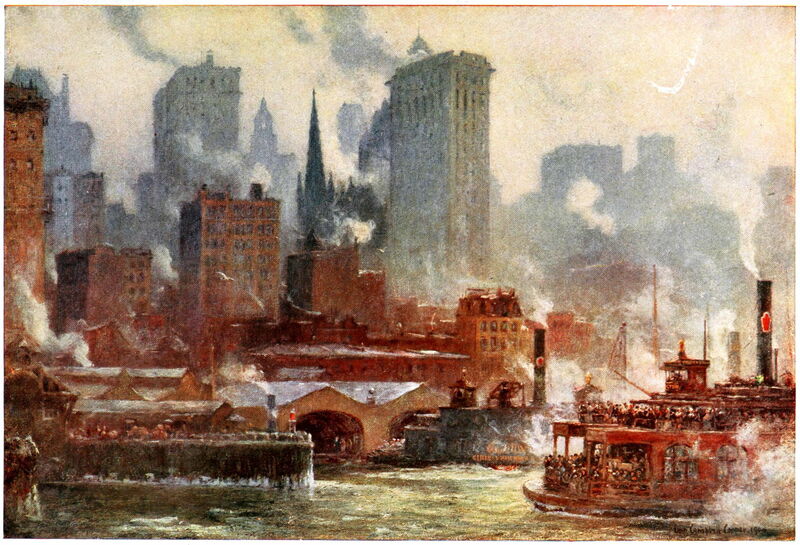 In New York (1911), there is a real foreground, and a densely human one too. Its human horizon, of figures walking past a white background, divides the canvas into two. Above is a vague blur of buildings, below a cacophony of vehicles, stalls, and people. As shown in the detail below, Bellows’ much larger figures in the foreground are little more detailed than the tiny figures in Cooper’s work. 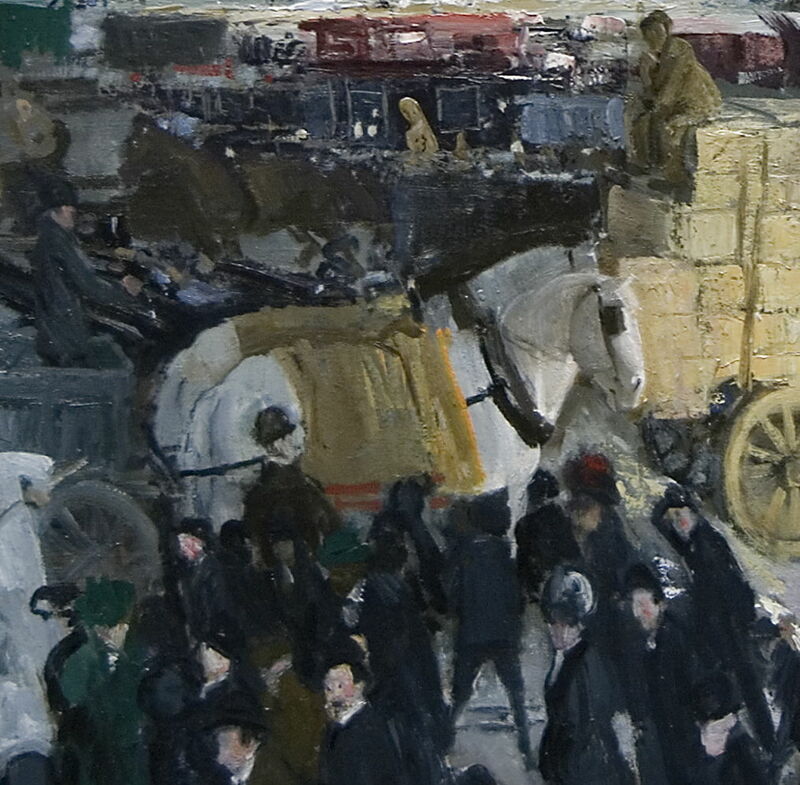 George Bellows (1882–1925), New York (detail) (1911), oil on canvas, 106.7 × 152.4 cm, The National Gallery of Art, Washington, DC. Wikimedia Commons. 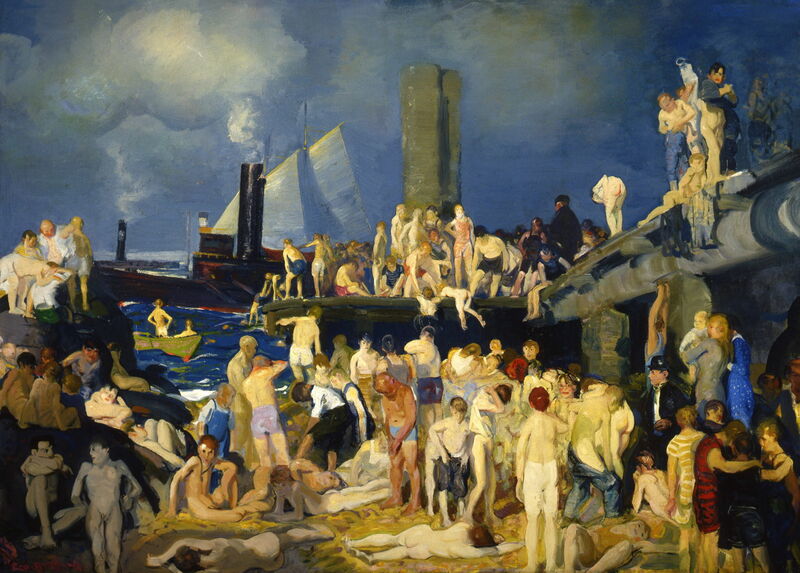 George Bellows (1882–1925), Cliff Dwellers (1913), oil on canvas, 102.1 × 106.8 cm, Los Angeles County Museum of Art, Los Angeles, CA. Wikimedia Commons. This is stated even more clearly in one of Bellows’ most famous works, Cliff Dwellers (1913). Bellows painted this from among its crowd, down at their level, and close in. This cityscape is its people. Despite their almost featureless faces, they are individuals, interacting with others, showing their personalities and pleasures. George Bellows (1882–1925), River Front No. 1 (1914), oil on canvas, 115.3 × 160.3 cm, Columbus Gallery of Fine Arts, Columbus, OH. Wikimedia Commons. A year later, Bellows’ figures have taken over his River Front No. 1 (1914). Their hairstyles, sunburn, and activities have drowned out the rest of the landscape. A few glimpses of a passing tug and a sailing boat are all that are allowed. 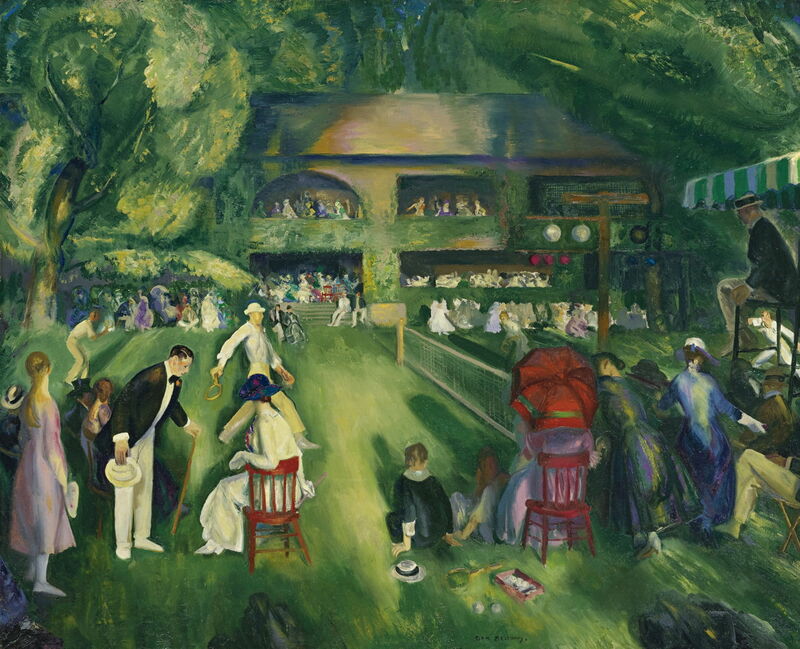 Later in Bellows’ career, when he painted another world of Tennis at Newport (1920), his figures had lost their individual character. Those closest to the view are almost all facing away in near-anonymity. The detail below shows how his more distant figures have become more gestural, closer to the loose dabs and daubs in Pissarro’s streets in Paris. 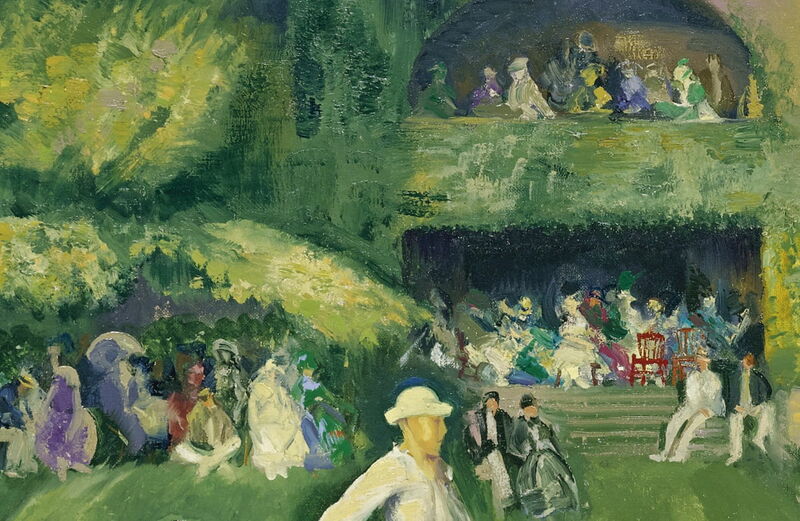 George Bellows (1882–1925), Tennis at Newport (detail) (1920), oil on canvas, 109.2 × 134.6 cm, McGlothlin Collection, Virginia Museum of Fine Arts, Richmond, VA. Wikimedia Commons. The figures in Colin Campbell Cooper’s and George Bellows’ paintings are far more than mere staffage in a landscape created by man. For Cooper, they are the detail that transforms the buildings into the city; for Bellows, they are the city. Posted in General, Painting and tagged Bellows, Cooper, figures, landscape, painting, Pissarro, staffage. Bookmark the permalink. What is ‘copy on write’, and how is it good?